The 1 bedroom/1bath. Killy/Kidd Race Condo sleeps 3. 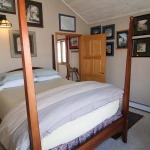 The master bedroom has vaulted ceilings and a pillow top queen bed with down comforter. The bathroom has large jetted tub with shower and slate tile floor. 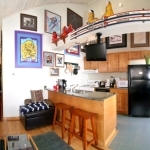 There is a fully equipped kitchen with granite counters and a 24″ flat screen TV with cable and netflix. 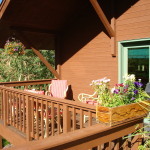 There are wood floors throughout and a covered east facing deck with gas grill and summer furniture. You’re looking right at ‘The Butte’. 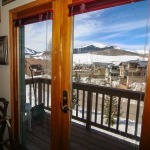 The west facing deck off of the bedroom has views of Mt. Emmons with incredible sunsets. Have a glass of wine and enjoy! There is a pull-out single bed in the living room for additional sleeping space. The condo is decorated with art work and skis all related to ski racing with rare posters that you will probably not even see in a museum.